Doughnut shop dunzo in Doraville. 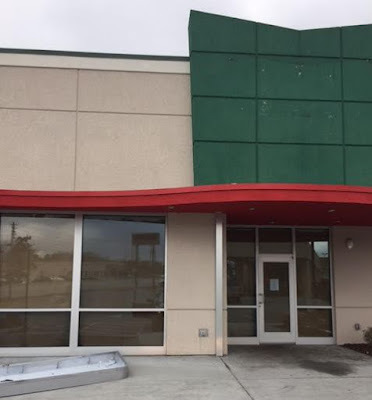 Winston-Salem, North Carolina based Krispy Kreme has closed its store on Buford Highway in Doraville. The freestanding location opened in late 2013 in an outparcel of Doraville Plaza. Krispy Kreme replaced what was originally built as a Long John Silver's restaurant, but had more recently housed a series of independent eateries. The doughnut shop was adjacent to an existing Chick-fil-A restaurant and just south of a new McDonald's. According to a source with intimate knowledge of the closing, it was a "corporate decision" as this specific Krispy Kreme was corporately owned. Krispy Kreme closed to the public as of Sunday, January 31st. A new Dunkin' Donuts is reportedly still opening on the site of a former Wendy's just north of the Krispy Kreme site. I say reportedly, as I wrote about the plans in September but the property has sat essentially untouched since. Krispy Kreme pales in comparison in both size and sales to that of rival Dunkin' Donuts and offers a far simpler menu. Dunkin' has significantly diversified their menu, adding new sandwiches, hot, cold and frozen beverages, as well as expanded their baked goods selection. Krispy Kreme, on the other hand, features a menu almost entirely dedicated to coffee and doughnuts. Earlier this month, Krispy Kreme executives detailed their plans to increase coffee sales, which today account for a mere 5% of total sales. Krispy Kreme recently introduced a new prototype location near its Winston-Salem headquarters that it hopes will reinvigorate coffee sales. Among the changes are a new layout a barista, and coffee ground on site. While these changes are obviously too little, too late for their Doraville location, perhaps the company will open or franchise a new location in metro Atlanta that features this new look. During the late 90s and early 2000s, Krispy Kreme opened a number of new locations including one that opened at Buckhead Exchange on Peachtree Road in Buckhead. It closed long ago. Remaining Krispy Kreme locations in metro Atlanta include their popular Ponce de Leon Avenue shop in midtown, as well as locations in Roswell, Marietta, Alpharetta, Decatur, Duluth, Buford and assorted other suburban cities. Are you surprised that this Krispy Kreme location closed? What would you like to see open in its place? Where is your favorite place to get doughnuts? Krispy Kreme was once seen as sort of unique and available only by driving to the location on Ponce or getting them through some fundraiser. However, now they’re available in most grocery stores and even many convenience stores along with the free standing stores. Bottom line the novelty sort of wore off and even though it’s good doughnut it’s not great. Krispy Kreme doughnuts are definitely better than Dunkin's, but as you mentioned, Dunkin' has a larger variety of food. And then in cities such as Atlanta, we have specialty doughnut shops like Sublime, Revolution, and now Bon Glaze. It's tough to compete. If I want a treat, I'd rather have the "high end" doughnut. And if I want breakfast, I need some protein, so Dunkin' has something with eggs at least. This is sad for Doraville, I frequented this KK quite a bit in its first year or so, talked to the manager a bit, and could sense that sales were not that great. This was just bad site selection by KK corporate, and I do believe that any Dunkin built nearby will have similar problems. Some KKs do well, but they tend to be in more spirited 'communities' (maybe a high school or two nearby, lots of parents and teens stopping in, mid to upper-middle class neighborhoods in close proximity). I didn't enjoy their coffee (tasted like basic bitter, bunn pour-o-matic office break room swill), and having a Chick fil A next door probably didn't help their morning business. But for donuts, I like KK, moreso than DD (which are all made offsite). I prefer DD to KK, but am really wondering what is going on with the Sublime @ Druid Hills that was announced last summer. From what I understand, the space lies untouched since the big news. The Dunkin on PIB in Norcross finally broke ground last week after a very very long delay. This is very sad for Doraville and their leadership. They need to put a moratorium on fast food. With their location and excellent city services Doraville can be a boon for new affordable housing by rezoning blighted commercial areas. its time for them to focus on that and the rest will come. Subline posted pictures the othe day of work starting in the space. Thanks Lady in ATL for the tip. I just checked out the pictures on their FB page. I am looking forward to giving it a try. Now, y'all know KK doughnuts that are sold in the gas stations and grocery stores taste NOTHING like the ones at the restaurants. The KK "HOT" glazed doughnuts sold at the restaurants are one of a kind. Dunkin Doughnuts has always been dry, not so sweet and tough to swallow. That's why they sell a huge selection of beverages to wash down that dry dough. LOL. Anon at 1:44 said the TRUTH. Krispy Kreme HOT doughnuts melt in your mouth! That is why DD has their coffee merchandised all over the place because people go for their coffee, not their side offerings. KK is a specialty shop while DD is a mass marketer. Why do you think they call themselves Dunkin Doughnts? -- Because you MUST DUNK their donuts in their coffee to be palatable. That HOT sign is on! Dunkin cannot hold a candle to Krispy Kreme! We will miss the Doraville store. We also like Dandy Donuts in Chamblee. There is a Dunkin very close to Dandy, but the Dandy donuts are much better, and they sell sandwiches, too. We would love you to come to Dunwoody!!!! We would love to have a Krispy Kreme in the EMBRY HILL SHOPPING CENTER. I will never buy DD, stores are often dirty and doughnuts day old. Really hate to see the one close on Buford Highway. KK doughnuts are not the same anymore. Years ago, they were delicious and you had to drive out a bit to enjoy the delight. Now, they changed the ingredients, try to add more stores near you. Eventually, that will backfire. People want good, quality products. I'm sorry but DD doughnuts are actually better. I used to like KK, but they are not the same anymore. Where is a Krispy Kreme in Dcatur? I thought I knew all of them. Peoples eating habits have changed, KK donuts are way... too sugary sweet. I swear I will get make major sugar buzz from them. I agree, I'd rather have a high end donut, Bon Glaze donuts in Brookhaven are fantastic, KK doesn't even come close. I have to admit, I was excited to hear that KK was opening in Doraville. I went there several times. When I was there in January, something wasn't right. The hot sign was on outside but there was no hot doughnuts and two employees was making negative comments about my doughnut selections. I made up in my mind to choose another KK location to buy doughnuts. Drove pass it the a few weeks ago, it was gone. It would sort of nice to see a pharmacy there. I wonder what's next. As mentioned in many comments Doraville is a vastly growing city in a great way. An A&W All American Food could maybe make their first Atlanta Ga location here or maybe an Arby's can open. Those would be good to accommodate this space possibly. Went to this location wants and they only had hot hours twice a day, and in three hour increments. I knew then, they wouldn't be around long. Poor customer service also poor parking it was hard getting in and out! I certainly want to see on near this area. DD doesn't hold a candle to KK.